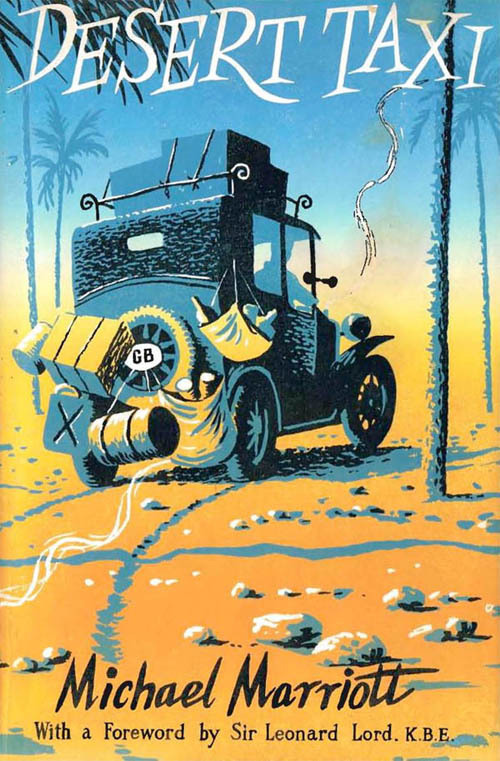 The cover of "Desert Taxi"
While Alfred & Jakobine's journey around the world in their vintage London taxi is the most epic story of its kind, it is not the only story of travel adventures in London taxis. During the mid to late 1950s, many old London taxis (specifically the aging 1930s fleet) found there way into the hands of young travelers seeking a unique (and affordable) way to explore the world. 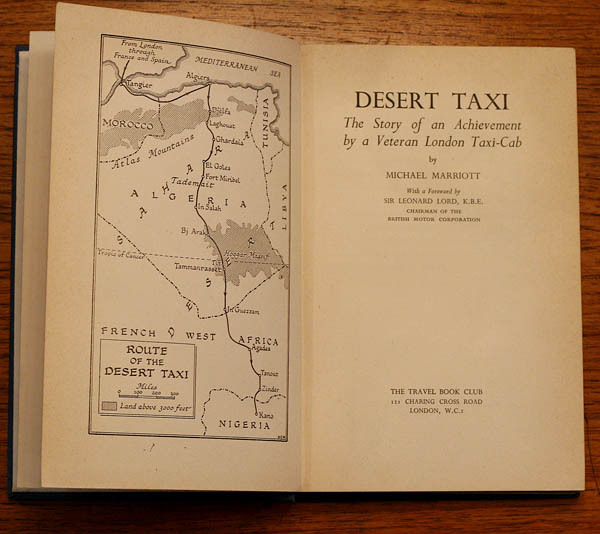 The most famous story (until A&J of course) was documented in the 1956 book Desert Taxi, The Story of an Achievement by a Veteran London Taxi. It chronicled the passage of the author, Michael Marriott and his wife Nita through the Sahara Desert in a 1934 Austin LL taxi, they named Bertha. 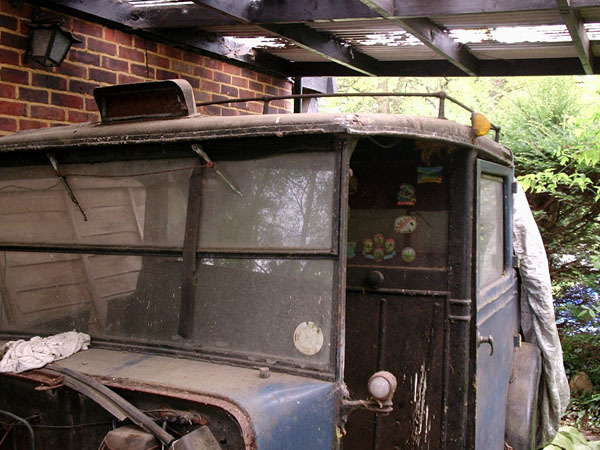 Starting in London, they planned to reach southern Africa in their old taxi, but didn't quite make it. Having driven 2300 miles though the desert (in addition to their miles through England, France, Spain and North Africa), with numerous near death experiences, their old Austin taxi finally died near Kano and was likely soon swallowed up by the sand. Fortunately, they lived to tell the tale. Below are some shots from the book Marriott wrote to tell the tale. Alfred, who had never heard of the story and book until recently, explains that Marriott chose a rather treacherous route. 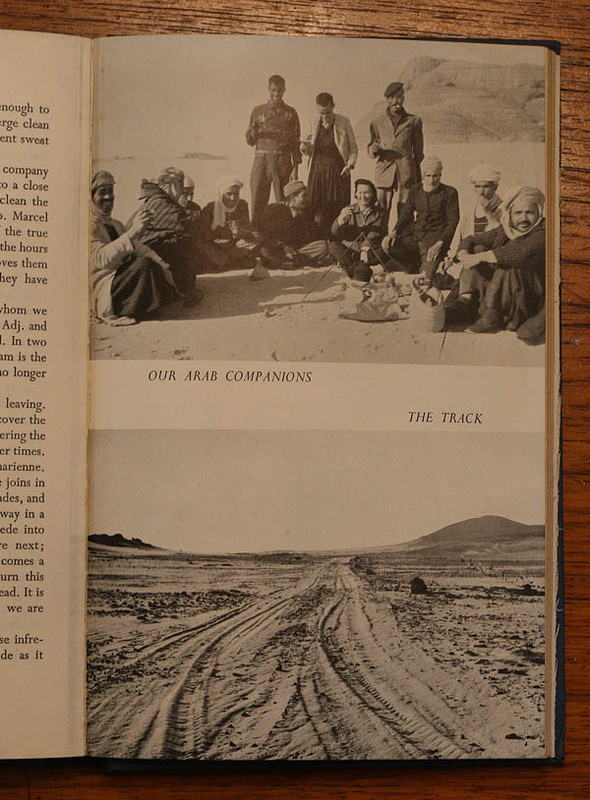 The route that Alfred plotted for their Sahara crossing was longer, but much safer, though they did encounter a lot of the same challenges as Marriott. Alfred and Jaokobine drove at night, because it was just too hot in the day time. The hot sand would grip the tires of the old taxi, barely letting them roll. As long as Alfred could see a particular star in the night sky, he was able to keep their course south though the night, with a few "exceptions" along the way! The Sahara was, of course, just the beginning of their amazing world journey that would take them deeper into Africa, then over to India, Pakistan, Afghanistan, into Asia, ending in Japan before returning to the U.S. with the taxi. The first spread from Desert Taxi featuring Marriott's route map. much like the view Alfred and Jakobine would have seen from their taxi. The Taxi Girls in Spain with Genevieve, their 1934 Austin LL taxi. The Taxi Girls (see previous post) were another famous case. Four young women from Toronto, on a whirlwind tour of Europe in the summer of 1955 in a 1934 Austin London taxi. They drew attention everywhere they went. Dozens of newspapers did stories on them, they appeared on television, and though they didn't encounter the same challenges that a passage through the Sahara Desert would present, they did find a few brushes with danger. The most entertaining was their accidental drive up the wrong side of an autobahn in Germany. Other, less well documented stories, indicate other groups who travelled far and wide in their 1930s Austin taxis. The Taxi Girls met two other groups in London taxis while they travelled that summer. 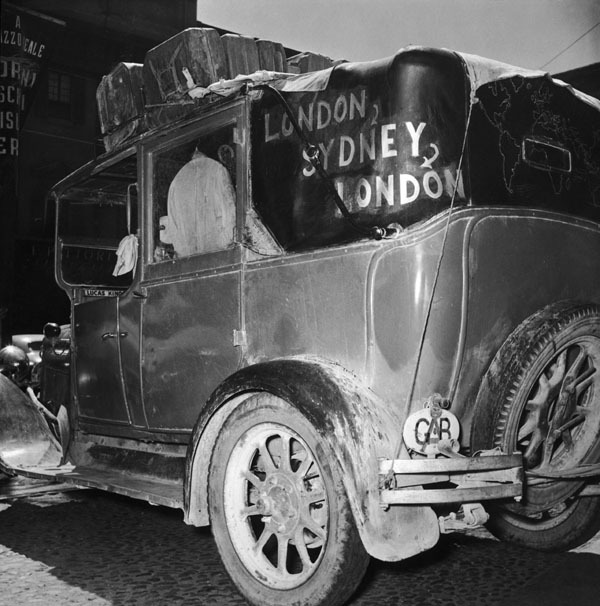 An archival photo from Getty Images reveals another 1930s Austin painted with the words "London, Sydney (Australia), London", and another journey was planned from London to Rhodesia, though they only made it as far as Casablanca before selling their taxi to, none other than Alfred and Jakobine. There is evidence of many other adventures in taxis. 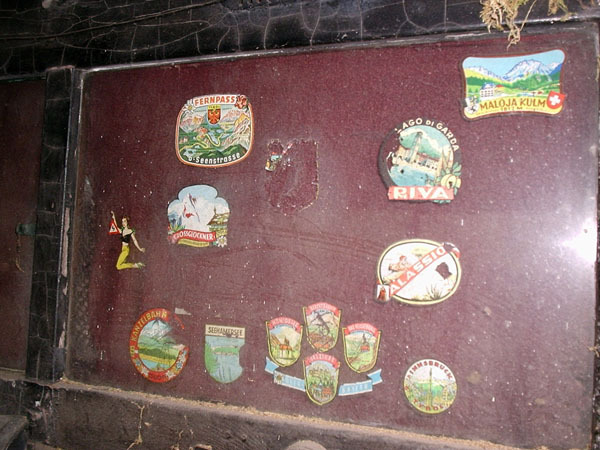 Some old wrecks have been found to contain stickers of countries passed through (see photos below), while others have turned up in scrap heaps all around the world. it saw after its life on the roads of London. Image reproduced with kind permission of Getty Images. The interior old Austin London taxi with stickers from a variety of European cities. Image courtesy of Warren Rushton. So what was the reason for this unusual phenomenon of travel in old London taxis – a phenomenon that appears to be isolated within the mid to late 1950s and feature only the 1930s generation of London taxis? Tune in next week for an explanation! In the mean time, please spread word about "Alfred & Jakobine" We must build awareness of the project, and raise financial support for the film with our "Buy-a-mile" program. See you next week.